Polylactic acid (PLA) is one of the primary alternatives to traditional oil-based plastics. Polylactic acid is highly popular as a plant-based polymer because its general performance characteristics are similar to many non-compostable polymers and can be processed in similar ways. There are some distinct performance trade-offs that must be considered when using polylactic acid as a laminate element in flexible barrier packaging, but with continued technological advancements many of these are becoming moot. Initially we will give a brief overview of both biodegrable and compostable material classes, then explore polylactic acid in more detail. These are materials that can undergo biological anaerobic and aerobic degradation thereby creating water, carbon dioxide, mineral salt, biomass and methane as the product depending on the environmental factor that caused the decomposition. These are materials that can create compost when microbial organisms act on organic waste. In order to claim that a product is fully compostable, the product must meet all the requirements of a recognized testing standard, in the US, the Standard ASTM D6400 is applied. In general, the tests are designed to review the specification requiring that biodegradable/compostable products completely decompose in a composting setting in a specific time frame, leaving no harmful residues behind. 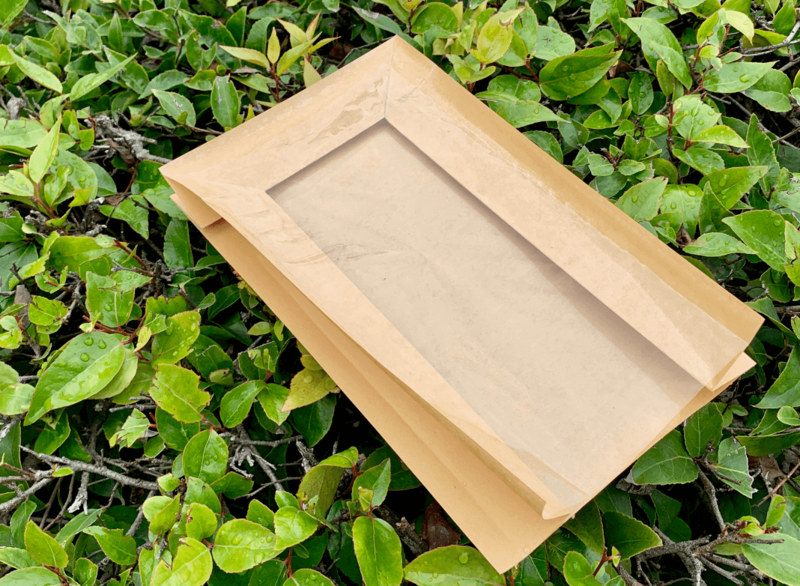 Biodegradable and compostable barrier packaging materials are highly needed in today’s modern world to keep our foods, drugs and some other valuable substances safe, while also reducing the amount of waste that clogs our landfills and oceans. It is very important that foods, drugs and other perishable substances should be properly packaged and kept so they can have a long shelf life. These packaging materials offer protection to products against the influence of light, water, air and other environmental factors that might affect it. However, bearing the rate at which our environments are polluted, the material that should be used to packaging goods should be biodegradable, compostable or easily be recycled. In the process of biodegradation, the packaging material turn into compost and decay after use. Another movement in flexible barrier packaging is the advancements in active an intelligent packaging. Barrier technology continues to improve, and so-called active and intelligent packaging is becoming a reality. Active packaging is a means of maintaining the optimum desired barrier conditions to which a food is exposed, while intelligent packaging detects the status of foods e.g. quality, maturity inside the package. PLA Poly (lactic acid) or polylactic acid is a biodegradable and bioactive thermoplastic aliphatic polyester derived from renewable resources, such as corn starch. This is unique and ground-breaking material. Polylactic acid can be made from: Sugarcane, Cassava, and corn, among other sugar rich plants. Polylactic acid can readily decomposes and biodegrades into biomass, water and co2 at ambient temperature conditions in open air landfills and requires no specialized compositing facilities. Let’s quickly brush up some of the important benefits barrier packaging material and how they’re made. How is polylactic acid made? Polylactic Acid is principally made through two different processes I.e condensation and polymerization. The most common polymerization technique is known as ring-opening polymerization. This is a process that utilizes metal catalysts in combination with lactide to create the larger polylactic acid molecules. The condensation process is similar with the principal difference being the temperature during the procedure and the by-products (condensates) that are released because of the reaction. You might not know the extent of the usefulness if this material until you try. Here are some the reasons why biodegradable and compost barrier packaging made of polylactic acid is the best and some of the features. Polylactic acid is very clear, can be processed into either a COEX or Biaxially oriented film (BOPLA). BOPLA is the most common form of film used for flexible packaging. Polylactic acid can specifically replace PET, and biax PP film layers. When polylactic acid is laminated to a paper it can create a more durable packaging solution than when PLA is cross laminated to itself. They are certified compostable by the Biodegradable Products Institute (BPI), petroleum-free and registered as USDA Bio-based Products. It is a cost-effective barrier that has been used for granola, candy, chips, cosmetics, jerky, pharmaceuticals, powders, and many other products. Packaging that incorporates polylactic acid into its material composition has several unique features that makes it a great choice for many food and drug manufacturing companies. Made from plant based material. When polylactic acid is used as an inner barrier liner it is food safe PLA and can be used with paper to create appealing easy-view window. Common applications of polylactic acid packaging: coffee, pasta, cookies, and more. Most of these products weigh less than 13 pounds. Supply Chain issues, and availability. Poor MVTR performance without additional coatings. These material that is made of PLA has so many applications and have been approved for use for food, medical, and general industrial purposes. Since the interior of packaging made with polylactic acid PLA are often coated with other materials always coated with LDPE sealant layers which enables it to be heat sealable. Want to explore packaging your product in Compostable PLA? Contact Us to Discuss.